This comment was posted to reddit on Mar 15, 2016 at 3:33 pm and was deleted within 58 minutes. I have no idea what this guy believes, and if he is resorting to essentialism (race X is inherently smarter than race Y, aristocrats are "better" human beings than poor, etc.) then he is full of crap. 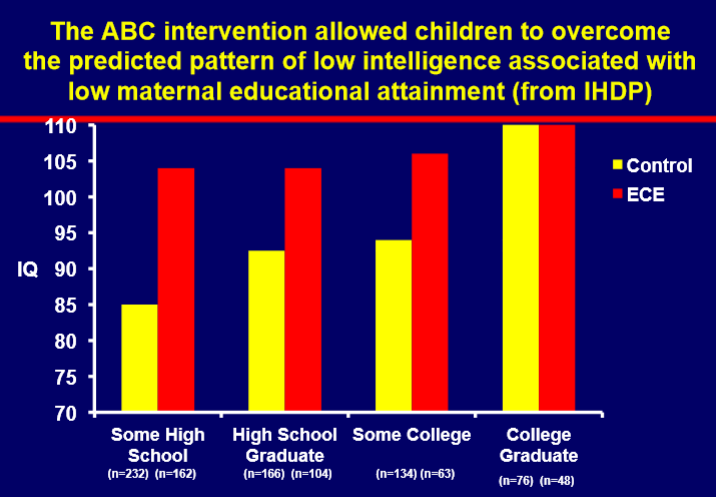 But I think it would be hard to argue that the "class" of parents is not a predictor of intelligence. It has nothing to do with genetics or any other essentialist nonsense, rather it is a result of early schooling and stimulation. The Drs. Ramey (married professors at VTCRI) built their career on the Abecedarian project, out of UNC - Chapel Hill, which sought to quantify the effect of early stimulation. The project recruited kids from all over the state of North Carolina, then split them into two groups. The two groups were further stratified into four compartments of SES / educational attainment. All controls got free medical care and nutritional assistance, while cases got that plus a few hours per day of preschool and brain stimulation from age one to five. The theory was that low SES parents could not afford preschool and could not take the time to engage with their babies as much as well-off parents. The results were freaking amazing. See this graph taken from presentation referenced below. Among the controls, children of 9th grade dropouts averaged an IQ of 85, children of HS grads about 95, children of college grads about 110. Among cases, the dropout's kids averaged 104, HS grads 106, and the college grads still about 110. The children of college grads had effectively no benefit, but the children of 9th grade dropouts got a near 20 point boost (more than one SD). The preschool training significantly reduced the disparity between the classes. The case kids also did much better in life, were less likely to have drug or alcohol problems, less likely to get into legal trouble, more likely to finish college themselves, and surprisingly less likely to become obese. It was an amazing experiment. Here is a video of the Ramey's talk at VBI last year, and here are the presentation slides. If anything, the project demonstrated that at a population level, race and genetics play a small role, where as early schooling is absolutally paramount. The kids of "high class" parents (high SES and well educated) have an incredible advantage today. Pretending this is not the case is not only silly, it prevents us from taking steps to correct this disparity (e.g. universal preschool, which the Ramey's made a great case for). Need help with dorms Questions from alum who graduated before the internet ('94) Archery Weekly Q/A - week of July 30, 2017 ***NEED HELP WITH VT on PLACE*** Virginia Tech will likely become the first university in the country to create a school of neuroscience. Hokie alum Adam Ward among the WDBJ news crew shot and killed during a live interview this morning Tips for Freshman year Possible threat posted on YikYak last night - be vigilant today. Question for engineers: Honors housing or Galileo/Hypatia? Why?